Abert Rim is a spectacular example of a fault scarp-look behind you [at the marker site] and to the east to see a steep cliff produced by periodic vertical movement of a geological fault. The 30-mile-long, 2,500-foot-high rim was created over millennia by great blocks tilting and moving in a region where the earth’s crust is thinning or stretching. The fault that produced Abert Rim is one of many in the Basin and Range Provice- a geologic region where rising blocks of crust (horsts)form mountain ranges, and sinking blocks of crust (grabens) create broad basins. The region spans about 300,000 square miles, including almost all of Nevada and parts of Oregon, Idaho, Utah, California, Arizona, and New Mexico. 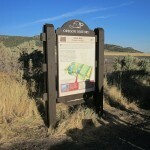 Geologists believe the crustal movements contributing to Abert Rim’s formation were probably accompanied by earthquakes of up to magnitude 6 to 6.5. They also believe the fault is still active. Lake Abert, in the basin below Abert Rim, covers 63 square miles-but it is only a remnant of Ice Age Lake Chewaucan, which once covered over 470 square miles. Lake Chewaucan’s shorelines can still be seen lining Abert Rim’s cliffs, far above the present shoreline. Archaeological evidence shows that Native Americans have been here for about 11,000 years, with the greatest use between 2,000 and 500 years ago. Most lived in pithouse villages along Lake Abert’s shoreline. Artifacts suggest these early people were affiliated with ancestors of the modern Klamath and Modoc Indians, who live to the west.